Developers of popular video game Apex Legends are in the final stages of introducing a new crypto-themed character — if recent leaks are to be believed. Update (2019-03-29): In another likely confirmation that Crypto will be included in Apex Legends, this Reddit user found a hint on the Apex Legends website. In a photo available for download on the official website, you can see Crypto in a legendary frame in the far-left corner. That’s a crucial clue. There is another hint in this photo as well which is admittedly more of a stretch: in that same photo, you can also see green batteries falling down. The logo on these batteries is similar to the leaked Wattson skin which features the logo on her arm. 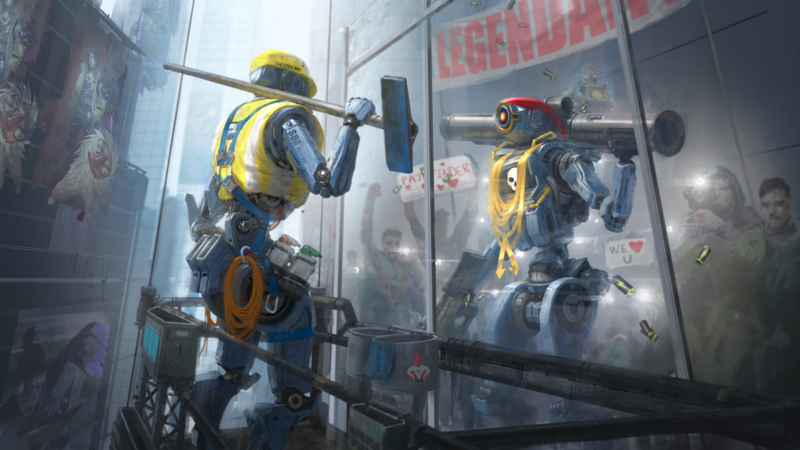 These minor details might point towards confirmation that Apex Legends will, indeed, be adding Crypto and Wattson to its massive game. There’s been other evidence floating around, but this photo from Apex Legends’ official website points to some interesting hints that will be proven in due time. Why else would they include these little details in an official photo? Makes you wonder. Paul Tassi, a Senior Contributor at Forbes, found an image that highlighted the titles of 11 unreleased characters that may appear in the game at some point in the near future. The leak is further corroborated by the discovery of hidden text in the game’s asset files. Since the game is completely free to play, its monetization strategy revolves entirely around cosmetic microtransactions and randomized loot boxes, which have been dubbed “Apex Packs.” These optional upgrades allow players to unlock new outfits, weapon decals, and characters — all of varying rarities. Among a long list of other names — including Nomad, Octane, Jericho, and Rosie — the Forbes reporter discovered evidence that ‘Crypto’ might be the name of an upcoming character. Given that existing characters in Apex Legends have been named on the basis of their special abilities, it is reasonable to assume that Crypto will be no exception to this rule. However, like the aforementioned Blockchain Reaction outfit, a direct connection to digital currencies seems unlikely. The Forbes reporter speculated that the new Crypto character could feature the ability to hack or intercept nearby communications, electronic devices and other enemy special abilities. However, until the character is officially announced by the game’s developers, Respawn Entertainment, it is difficult to say what Crypto’s utility will end up being. Released only a few weeks ago, Apex Legends has been received very well by fans of the Battle Royale video game genre, as well as critics in the industry. Its popularity is best represented by the fact that 25 million unique players tried the game within one week of its debut. According to the game’s developers, the concurrent player count also topped two million within the same time-frame. Which special ability do you think will be assigned to Crypto? Do you play Apex Legends? Let us know in the comments below!